This page is dedicated to the wonderful group of fuzzies currently in need of a home. 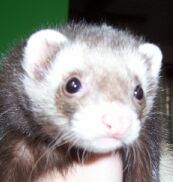 Check back often for additons and to learn about the newest "Adoptable Ferret of the Month!" 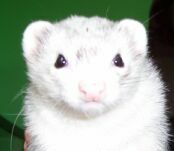 As more ferrets come into the shelter, more pages about them will be added to the website. Please keep checking, or email Jen for further information. DO YOU HAVE A FERRET YOU NEED TO SURRENDER? Click here for information about surrendering. 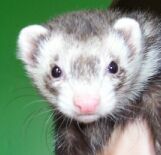 Currently, there are 3 ferrets in the shelter awaiting homes. Squiggles, Smokey and Kiki are a trio of young, fun loving kids that must be adopted together. Squiggles is a heavy silver girl, about 2 years old. Smokey is a chocolate boy and the youngest, about a year of age. Kiki is a very striking light silver girl and the oldest at 3 years of age. All are very friendly and exceptionally playful. This would be a great opportunity for a first time or previous ferret parent who wants an already existing family or someone who wants to add a family to thier fuzzy family. Don't pass this group up! This month, we have a trio for our adoptables of the month! Squiggles, Smokey and Kiki are a great trio of kids, all 3 years of age or younger, that must be adopted together. All are exceptionally friendly and playful and 100% litter trained. If you're thinking about adopting an already existing family or looking to enhance a smaller fuzzy family, this is the trio you've been looking for. They socialize well with other ferrets, and haven't shown any signs of health issues such as adrenal disease or insulinoma. The shelter also gives discounts for those who adopt multiples, so the price is right too! And did we mention that you'd be providing a home to not just one but 3 kids in need of a forever place to be loved? Please consider this great trio. Email the shelter for more information or for an opportunity to meet them in person!